The first time I met Stony was during my first Challenge, Class 524 in Toronto. I had read on another blog that he had done the Challenge the year before, and I saw the video he made of the creation of our team weight. This guy was dedicated. During the event he was quiet, except for when someone needed help. He was always willing to assist the team by carrying someone’s ruck or to lend a hand. I imagined he knew what we had in store, but instead of spoiling the surprise, he just let us experience the Challenge fresh. Fast forward a few years, he’s still the same friendly guy. He still comes out to Challenges (Class 659 video, Class 1571 video), and works with people to help them through the events. Except now he has a glorious face forest, and his muscles are a bit bigger. When I asked him if he would mind doing a segment with me about his gear, he didn’t bat an eye. Always willing to share, and always down for telling a good story. We need more guys like Stony. Damn Skippy! 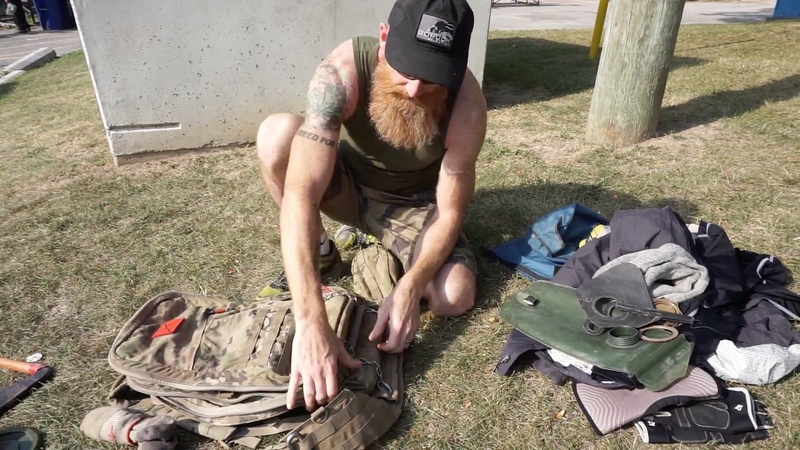 *Note - There will be another video coming out Saturday morning that will outline some of his ruck and boot modifications and what he wore during the challenge. Follow my page on Facebook, and you'll know exactly when it comes out. -PT belt, Green –safety First! -Under Armour Heat Gear loose fitting top. -My number 14 tan shirt. -Various D-rings, Carabineers, chains, and clips. Looking for more GORUCK articles? Reflective DFQ Patches - This is where you get em! Awesome. Great video, Mike. Thanks Stony! Awesome video, and even better breakdown! If you want to continue your strength training at home, then you need to invest in some strength training equipment. There are various kinds available in the market and they come in all price ranges. Its terribly spectacular, that is the diary you admire I likable it. If you wish a weight lifting belt to safeguard your back throughout long lifting sessions, you will be questioning what style of belt you must get. If you wish one to safeguard your back, browse on to search out out what style of one you wish.